A pacemaker-mediated tachycardia (PMT) can be defined as any condition in which a pacemaker paces the ventricles at rates that are inappropriately fast. This can be due to (1) a rate response setting that is too sensitive, (2) tracking of atrial noise (such as what may occur with electromagnetic interference), (3) inappropriate pacemaker manipulation with rate response turned on, or (4) tracking of an atrial tachyarrhythmia related to upper rate settings. Traditionally, however, the term pacemaker-mediated tachycardia, also called endless-loop tachycardia, is used to refer to a form of a reentrant tachycardia and can occur in patients who have dual-chamber pacemakers. The pacemaker forms the anterograde (atrium to ventricle [A → V]) limb of the circuit and the atrioventricular (AV) node is the retrograde limb (ventricle to atrium [V → A]) of the circuit. This classic form is referred to and discussed as PMT for the rest of this article. See the electrocardiograms (ECG) below. Telemetered ECG tracing with surface lead II (top) and intracardiac electrograms (atrial electrogram [center] and ventricular electrogram [lower]) and marker channel (bottom) showing pacemaker-mediated tachycardia (PMT). The intracardiac markers indicate that the retrograde P waves, labeled AS for atrial-sensed event, occur 280 milliseconds after the ventricular-paced beats, labeled VP. Telemetered ECG tracing showing atrioventricular (AV)–paced rhythm at 60/min after termination of the pacemaker-mediated tachycardia (PMT). The tracing, from top to bottom, shows lead II, atrial electrogram, ventricular electrogram, and marker channels. The intracardiac markers indicate the rhythm is atrial paced (AP) and ventricular paced (VP). Note that the VP beats are ventricular pseudofusion beats. This is a typical example of PMT with ventricular pacing at maximum tracking rate (VP-MT) and then termination of the tachycardia as the atrial sensing (AS) is in the PVARP. This is due to PVARP extension, which is a feature of this particular pacemaker. The solid line indicates where PMT is detected and this is the point at which PVARP extension occurs. As this electrogram was detected, but not sensed to be acted upon, the ventricular tracking stopped and the tachycardia terminated. In some cases, pacemakers have a program to lengthen the PVARP after PMT detection to potentially stop the tachycardia. Alternatively, prevention of one ventricular paced beat can also stop the tachycardia. Some pacemakers use this algorithm. The following is the most common scenario causing pacemaker-mediated tachycardia (PMT). A dual-chamber pacemaker programmed DDD or VAT, but not DDI, is implanted. The patient must have retrograde (V→A) conduction with an atrial activation time that is longer than the programmed postventricular atrial refractory period (PVARP). 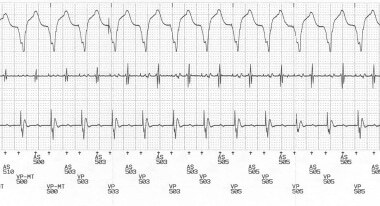 A ventricular-paced beat or a properly timed premature ventricular contraction (PVC) conducts retrograde via the AV node (or an accessory pathway, if present) to the atrium. If the atrial depolarization occurs after the set PVARP, but before the next timed atrial-paced beat, ventricular pacing will be triggered at the programmed AV interval. PMT tends to occur at or near the programmed upper rate limit and depend upon the programmed AV delay and the PVARP. This generates an incessant reentrant arrhythmia circuit that persists as long as there is continuous VA conduction with atrial activation outside the PVARP. The pacemaker forms the antegrade limb of the circuit and VA conduction forms the retrograde limb as the essential critical components. In many instances, the PVARP varies so that it shortens with rate. This can make PMT more likely. The AV interval can be programmed to change with the rate. This tends to reduce the risk of PMT. Depending on the pacemaker programming and the VA conduction, the rate of the PMT may vary, but it is bounded by (and generally occurs near or at) the programmed upper rate limit. Prognosis is not directly altered by an episode of pacemaker-mediated tachycardia (PMT) and is defined by the patient's underlying cardiac or medical condition. Indirectly, in a rare event such as PMT-induced syncope, a patient could sustain injury as a result of the syncope. Persistent PMT can cause hypotension and heart failure symptoms. Patients may experience palpitations, rapid heart rates, lightheadedness, syncope, or chest discomfort. PMT rarely is associated with any serious complications such as presyncope or syncope. In many patients, the condition may be asymptomatic and is noted only with ECG or Holter monitoring. With the appropriate programming interventions described above, the problem usually is resolved, and, in most modern pacemakers, it can be detected and treated by the device itself. In patients who develop chest pain (angina pectoris) associated with the rapid pacing rate, consider a stress test to evaluate for coronary artery disease. Monteil B, Ploux S, Eschalier R, et al. Pacemaker-mediated tachycardia: manufacturer specifics and spectrum of cases. Pacing Clin Electrophysiol. 2015 Dec. 38 (12):1489-98. [Medline]. Love CJ. Pacemaker troubleshooting and follow-up. Ellenbogen KA, Kay GN, Lau CP, Wilkoff BL, eds. Clinical Cardiac Pacing Defibrillation and Resynchronization Therapy. 3rd ed. Philadelphia, PA: Elsevier; 2007. 1005-62. Sharma PS, Kaszala K, Tan AY, et al. 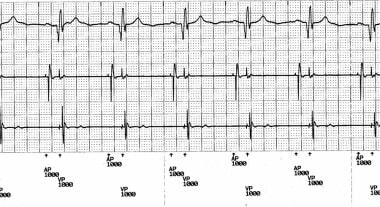 Repetitive nonreentrant ventriculoatrial synchrony: an underrecognized cause of pacemaker-related arrhythmia. Heart Rhythm. 2016 Aug. 13 (8):1739-47. [Medline]. Richter S, Muessigbrodt A, Salmas J, et al. Ventriculoatrial conduction and related pacemaker-mediated arrhythmias in patients implanted for atrioventricular block: an old problem revisited. Int J Cardiol. 2013 Oct 9. 168 (4):3300-8. [Medline]. Frumin H, Furman S. Endless loop tachycardia started by an atrial premature complex in a patient with a dual chamber pacemaker. J Am Coll Cardiol. 1985 Mar. 5 (3):707-10. [Medline]. Greenspon AJ, Greenberg RM, Frankl WS. Tracking of atrial flutter during DDD pacing: another form of pacemaker-mediated tachycardia. Pacing Clin Electrophysiol. 1984 Nov. 7 (6 pt 1):955-60. [Medline]. Rozanski JJ, Blankstein RL, Lister JW. Pacer arrhythmias: myopotential triggering of pacemaker mediated tachycardia. Pacing Clin Electrophysiol. 1983 Jul. 6 (4):795-7. [Medline]. Griffin J, Smithline H, Cook J. Runaway pacemaker: a case report and review. J Emerg Med. 2000 Aug. 19 (2):177-81. [Medline]. Klementowicz PT, Furman S. Selective atrial sensing in dual chamber pacemakers eliminates endless loop tachycardia. J Am Coll Cardiol. 1986 Mar. 7 (3):590-4. [Medline]. Frohlig G, Schwerdt H, Schieffer H, Bette L. Atrial signal variations and pacemaker malsensing during exercise: a study in the time and frequency domain. J Am Coll Cardiol. 1988 Apr. 11 (4):806-13. [Medline]. 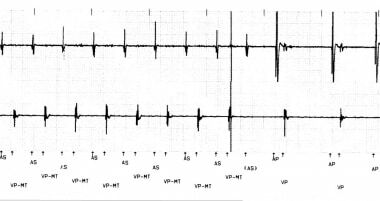 Horie K, Otomo K, Mori S, Kikuchi Y, Meguro T. Uncommon presentation of drug-refractory pacemaker-mediated common atrioventricular nodal reentrant tachycardia and a simple solution by reprogramming. Intern Med. 2015. 54 (9):1063-6. [Medline]. Ip JE, Lerman BB. Validation of device algorithm to differentiate pacemaker-mediated tachycardia from tachycardia due to atrial tracking. Heart Rhythm. 2016 Aug. 13 (8):1612-7. [Medline]. Strik M, Frontera A, Eschalier R, et al. Accuracy of the pacemaker-mediated tachycardia algorithm in Boston Scientific devices. J Electrocardiol. 2016 Jul-Aug. 49 (4):522-9. [Medline]. Disclosure: Received consulting fee from St. Jude Medical for consulting; Received honoraria from Boston Scientific for speaking and teaching.